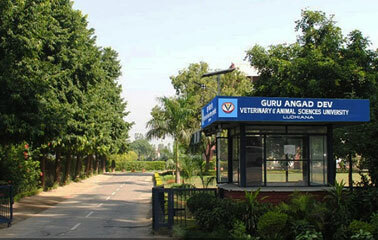 Sanman Smarpan Samaroh' was organized at Guru Angad Dev Veterinary & Animal Sciences University, (GADVASU) Ludhiana to dedicate the achievements of the institute to the whole family of Varsity. Dr. A S Nanda, Vice Chancellor of GADVASU in his inaugural address remembered the martyrs of Kargil War who laid their lives 19 years ago while protecting the boundaries of the country. He congratulated the administration, faculty, students and other work force of the University for putting their efforts in the cause of the University attaining first position amongst all State Agricultural Universities and third position among all ICAR institutes in the country for the year 2016-17. This ranking was conducted by ICAR, New Delhi. He also congratulated the students and staff for getting overall Runner’s Trophy in All India Inter agricultural universities youth festival. He appreciated the efforts of the Directorate of Extension Education for securing 3rd position at National Level under Swachhta Pakhwara Award by KVK, Tarn Taran. He motivated the scientists to work harder in coming times to sustain this position. He also emphasised on the point that scientists of the University must work with more enthusiasm to achieve prestigious awards like Jawahar Lal Nehru Award, Best Women Scientist Award of ICAR and Fellowship of NAAS and other professional Societies.